Chief among the excitement for 'Star Wars Rebels' is its ability to plumb the depths of periods mostly unexplored on film, particularly between the time between trilogies wherein the Empire cemented its power. The Imperials will be at their full strength when 'Star Wars Rebels' debuts later this year, and we've got the latest photo of classic Stormtroopers in action under the Inquisitor! 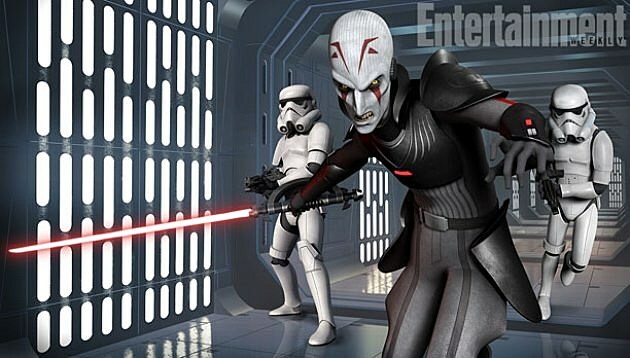 Via Entertainment Weekly, the newest photo from the animated adventure series replacing 'Star Wars: The Clone Wars' gives us a better sense of the animation style to come, featuring the iconic Stormtroopers (clones, or no) backing the villainous Inquisitor we've heard so much about. Interestingly, it appears the villain's lightsaber can either fold, or split the ring around its hilt, becoming a kind of hand guard. Hopefully we'll soon get a sense of the real voice cast, as well as a look at all the other characters. In the meantime, check out EW's new shot from 'Rebels' below, and tell us what you think of the classic designs in the comments!